What is the only thing more impressive than a glass elevator cab? Glass cabs create the kind of architectural statement that can lift a hotel, stadium, residence or shopping complex out of the ordinary, and into the extraordinary. Interior cabs enhance the scale of soaring lobbies or atriums, while exterior cabs provide passengers with a thrilling ride and stunning vistas. In the end, the only thing more impressive than a glass cab is the view from inside. Because as many as three sides of the cab can be fully exposed, the potential for innovative and distinctive design is virtually unlimited. Round or irregularly shaped glass cabs help define the chic styling of a modern shopping mall or hotel. Rectangular glass cabs with intricate metalwork create an unmistakable sense of old fashioned elegance; while cabs enclosed within a cage of exposed steel girders proudly declare an faux industrial style. At Gunderlin, we've built a wide range of glass elevators, for a variety of building types. Many of these elevators have since become memorable centerpieces for the famous buildings they serve. 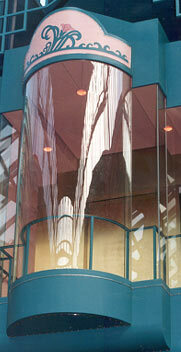 Use the links below to read more about some of the glass elevators that we've made. You might discover that you've already ridden in one of Gunderlin's many glass cabs.